On the 10th Anniversary of September 11th, members of the FBI Citizens Academy Alumni Association attended a special screening of Scott Rettberg's film, New York Says Thank You. 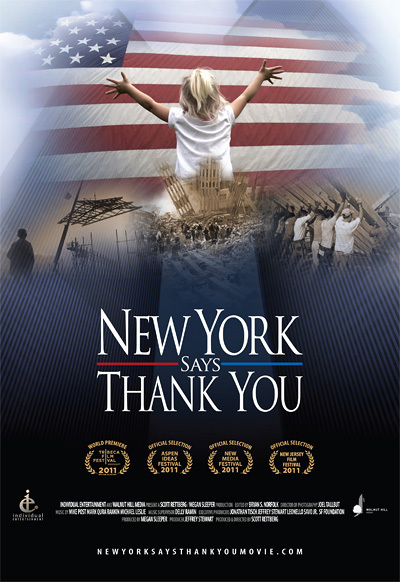 The film is an epic story of healing and patriotic herosim that charts the journey of four New Yorkers whose lives were touched by September 11 as they traveled the country to help communities rebuild after their own disasters. This feature-length documentary film casts a hopeful light in the shadow of the tragic day as they are joined every September by an ever-growing group of disaster survivors and volunteers from around the country to pay forward the support they once received. New York Says Thank You was a powerful reminder of the resilience and unity that joined Americans to each other on 9/11 and in the years since. Cick here to view photos from the event.